While the sun does a lot of good for us, sometimes it can be just plain annoying. Whether it is shining in our eyes or turning the interiors of a our vehicles into an oven, some days we just can’t wait for the night time. Luckily, there is a way to reduce the blistering impact of the sun while you are in your car, truck, or SUV: window tinting. Window tinting isn’t just a great way to improve the look of your car, it actually serves several important purposes that can save you money and keep you safer while you’re on the road. If you want to have professional window tinting for your vehicle, give us a call at R.P.M. Performance in Burlington. In addition to tinting windows, we can add a Line-X bed liner to your truck, help you find a great new set of wheels and tires, or perform any collision repair that you need. Read on to learn about some of the ways that window tinting can improve your drive. Window tinting darkens your windows so you won’t have to deal with glare in the morning and evening, and it stops UV rays, which have been linked to skin cancer, from entering your car. Tinting is also an excellent way to make driving more fun no matter what time of the day it is. If you drive a lot, you know how annoying it can be to have the sun constantly shining into your car. Even with sunglasses on, the sun can easily be too bright to be comfortable. Prevent headaches and distracted driving before they happen with tinted windows! Tinting your windows is a smart way to prevent yourself from coming into contact with too many UV rays. 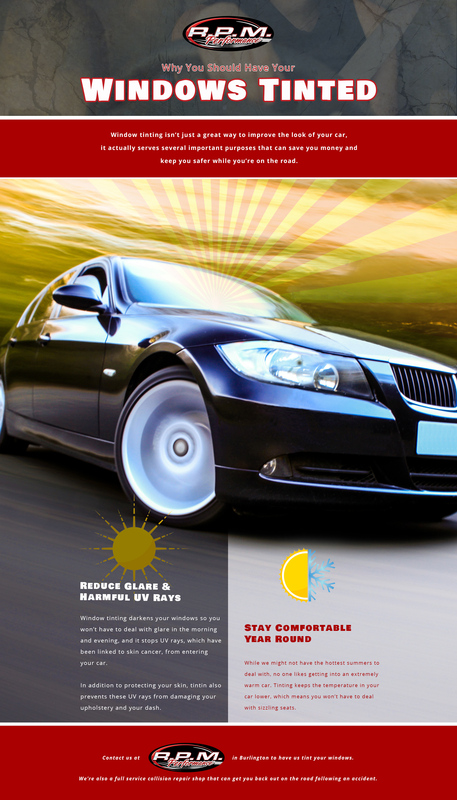 In addition to protecting your skin, tinting also prevents these UV rays from damaging your upholstery and your dash. Consistent exposure to the sun’s rays can end up making your leather and cloth seats dry, bleached-looking, and will shorten the life of your upholstery by years. While we might not have the hottest summers to deal with, no one likes getting into an extremely warm car. Tinting keeps the temperature in your car lower, which means you won’t have to deal with sizzling seats and crazy hot air. If you like being able to drive your car without sweating or without having to run your AC all of the time, tinting your windows might be a great way to have it all! Contact us at RPM Performance in Burlington to have us tint your windows. In addition to tinting, we are also an authorized Line-X installer. Our technicians can quickly and perfectly spray on a bed liner that is built to withstand impacts, UV rays, and many common chemicals. We’re also a full service collision repair shop that can get you back out on the road following an accident. Whatever truck accessories you need, R.P.M Performance can help. Give us a call today for a free estimate.